The 35-year-old actor was "shocked" that the 'Training Day' star didn't get angry when he accidentally head butted him while shooting their latest movie 'Safe House' and instead just told him not to worry about it. He said: "You get some injuries, and sometimes you're actually making contact. You don't want to be punching Denzel Washington in the face for 18 takes, but I did give him a black eye, which did not feel good. "Shockingly, he was OK about it. I thought he was going to turn me into liquid or something at the end of the take. I thought, I'm going to be asked to leave. Not just the set ... Cape Town." In the movie, Denzel's character is the victim of waterboarding - a form of torture whereby an individual is shackled down as water is poured over their towel-covered head - and Ryan admits it was "disturbing" to watch the 57-year-old star act out the "horrible" scenes. He added to Shortlist magazine: "I've never seen waterboarding done before. Denzel was under the towel for some of it as well, which was also disturbing, because he wanted to see what it felt like. "I've been told the sensation is truly like you're drowning. I didn't want to have a go. If my character was waterboarded, I would have done it. At least that's what I like to think. But, no. I don't have a go. It was difficult to watch. Horrible." 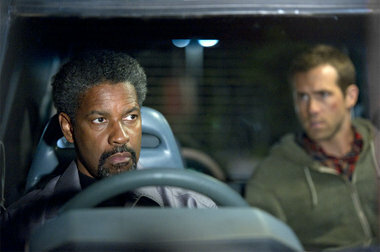 Denzel explained: "There was some acting involved, but it's very disorientating. I was doing what anyone would do, which is try to hold your breath, but once you get some air in there..."